Among conceptual fusion schemes, this is one of the simplest and most aesthetically appealing, but has been only partially explored, mainly because it is by far one of the most recent. The late R. Bussard described this concept, which he called "charged-particle-electric-discharge-engine" and later "quiet energy discharge", or QED for short, in a 1990 paper [Bussard, 1990]. The fuel (positively charged after having been stripped of its electrons) is injected in a radially symmetric mode into the reactor, made of a spherical wire mesh. The wire mesh (the anode) is kept at a potential of order —100 kV, and attracts the fuel electrostatically. While attracted and traveling toward the anode the fuel is accelerated and compressed, because density increases as 1/r3, with r the distance from the center of the sphere (see Figure 8.19). For sufficiently negative mesh potential, at some distance r from the center the fuel should satisfy the Lawson criterion and ignite. Fusion products tends to escape isotropi-cally, and should be collimated in a beam in some way, otherwise net thrust would be zero. This concept is being investigated in the US at the University of Illinois; see also [Miley et al., 1995, 1998]. The ICF concept is also attractive because a proof of principle can be realized in a conventional laboratory. Scaling from a table-top demonstration to a propulsion system involves quite a few steps, but the results were encouraging [Bussard and Jameson, 1993; Bussard et al., 1993; Miley et al, 1998; Froning and Bussard, 1998]. 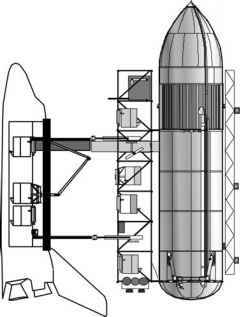 NASA-Marshall SFC took note of QED and funded D. Froning and B. Bussard in 1997; after a single grant, this fusion technology could not find any follow-on support from either US DOE or NIST [March, 2004]. Figure 8.19. 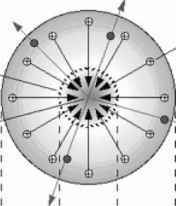 Conceptual scheme of an inertial electrostatic confinement reactor and of the radial distribution of its electric acceleration potential. In the EU, research into fusion for power generation has been under way for decades focusing exclusively on tokamak technology, leaving little room for innovative ideas in the process. Ill health forced Dr. Bussard to reduce his research activity and to concentrate on publicizing his ideas until he passed away in 2007. Progress in IEC is now in doubt.